Tickets: £15/£12 (£20/£18 on the door) from here. What would the late Mahmoud Darwish (Palestine’s National Poet 1941 – 2008) have said about what is happening across the Arab world today? Would he have written a eulogy to those sacrificing their lives in search of freedom and dignity? 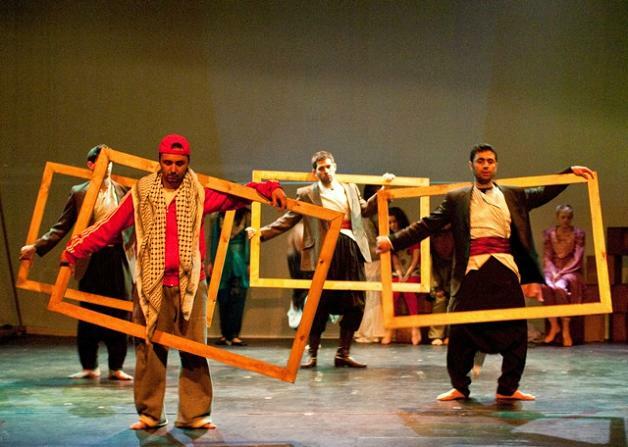 On Saturday, Britain’s leading Palestinian dance theatre group, Al Zaytouna, will take its latest full-length production, written by Ahmed Najar, and entitled “Between the Fleeting Words” to Nottingham, UK. 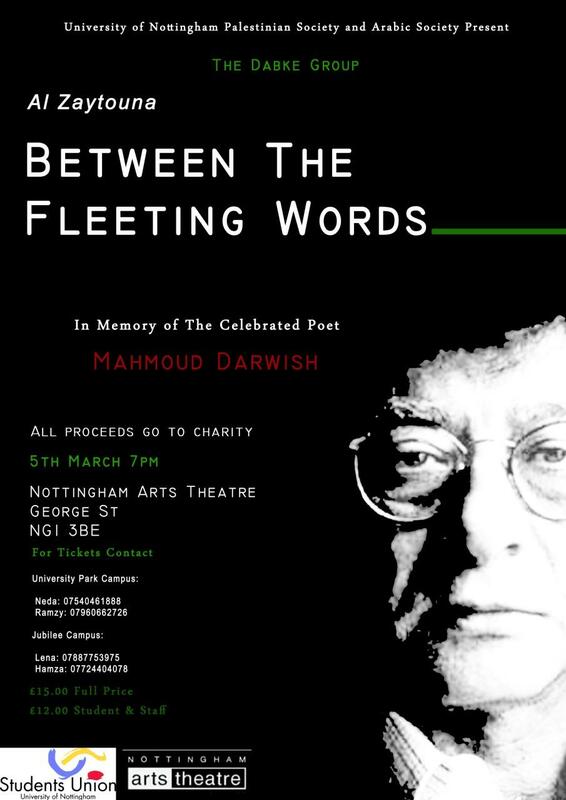 The title of the play, of course, is from one of Darwish’s most celebrated poems, and his vision, in its visceral truth-telling, its unrelenting assault on our sensibilities is at the heart of our production. The show was first debuted in London in May 2010 and then taken on tour to Slovenia in Sepember. In the time since, the Arab world has seen the beginnings, and now the blossoming of a full blown revolution, an Arab Spring. And the echoes of Darwish’s dreams and exhortations are sounding all the more pressing, all the more insistent, now that some of those dreams are starting to emerge into our present. The show fuses traditional dabke (Palestinian dancing), contemporary dance, poetry, music, and digital media to produce a unique celebration of Palestinian life in its enduring, stubborn dignity, telling the story of a mother trying to protect her family despite the challenges faced by the ongoing, decades-long Israeli occupation of Palestine. The show is a heartfelt tribute not only to Darwish’s art, a celebration of his poetry, but also a bold musical interpretation (a rereading?) of his work, using his own words to tell the story of Palestine through the experiences of its people. We also use folkloric songs, those powerful heartbeats of the Palestinian national soul, including classics such as Dalouna, Mijana and Zareef. Darwish’s words today play an important role in shaping the identity of diaspora Palestinians. Celebrated poems such as Write Down! I am an Arab; My Mother; and others have always connected Palestinians to their homeland. But for those living in the West they have become psalms of the tragic, human dimensions of the Palestinian cause. 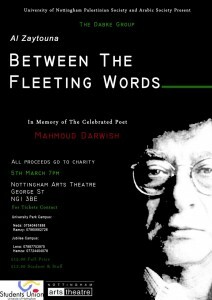 This production brings into focus the suffering incurred in Palestine as a result of the occupation, using Darwish’s words as the backbone of the story. 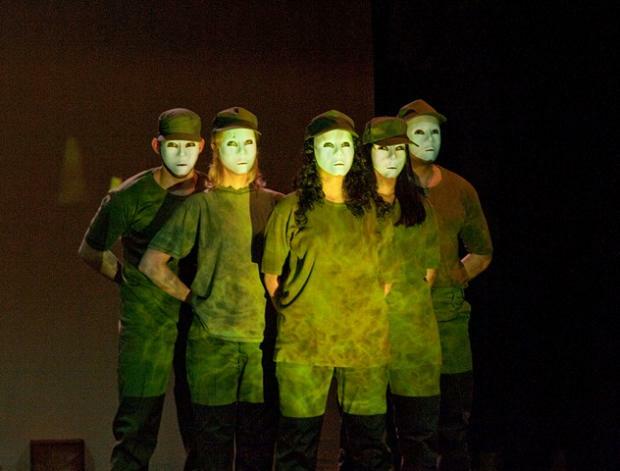 The show also commemorates the 62nd anniversary of the ‘Nakba’, the Palestinian national catastrophe of 1948, and explores themes of identity, struggle, loss, and resistance – real issues which touch, at the most personal of levels, many members of our group, and inevitably contribute to the passion with which they perform. Ahmed Masoud is a Palestinian academic, writer and director. He is the founder, in 2005, of the Al-Zaytouna Dance Theatre group and director of ‘Between the fleeting words’. He has also worked with award-winning British writer/director Justin Butcher to co-write/direct the successful play, Go to Gaza, Drink the Sea staged in London and at the Edinburgh Fringe Festival in 2009. Most recently, the pair have successfully wrote a BBC Radio 4 play entitled Escape from Gaza available on youtube.